SAN DIEGO (COUNTY NEWS CENTER) — The summer solstice, the first official day of summer, has arrived — which means it’s also the start of summer swimming pool season. So, it’s time to make sure if you have a pool that you’re doing everything you can to keep it safe and clean. Safe because even though pools are fun, they can be dangerous places too. And clean so that none of your summer swimmers gets sick. San Diego County’s Department of Environmental Health (DEH) has a few tips to help you do that. DEH doesn’t inspect homeowners’ private swimming pools. But it does inspect about 7,000 public pools and spas every year to make sure they’re safe and clean. Here are 10 tips to help make sure your swimming season goes, well, swimmingly! 1. Watch the Kids! This is rule number one! Every year children get seriously hurt or even drown in residential pools all across the U.S. Whenever children are around the pool, or in it, always watch them. Remember that water wings, Styrofoam “noodles” and other toys are not safety devices and children wearing them should not be left unattended. Teach your kids how to swim (and learn yourself if you don’t know how). 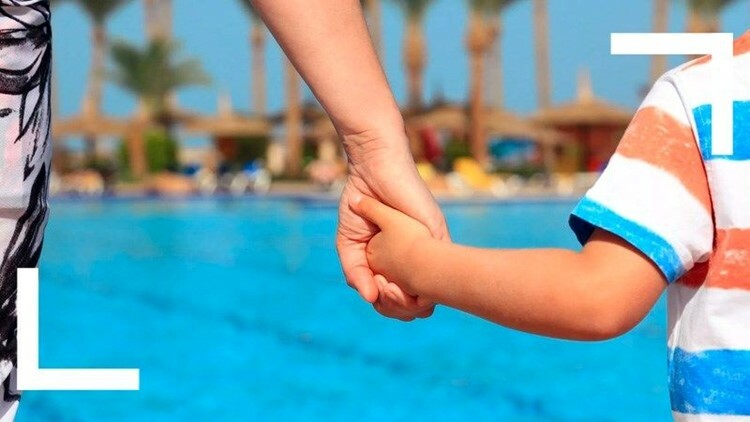 If your house opens directly into a pool area, install a door alarm to alert you when a child opens it. If you don’t already have a fence between your house and pool, consider putting one up (Be sure to check local and state pool safety laws which may require certain features depending on when a pool is built or renovated). Kids wander around a lot and can find their way into the pool even if they’re out of sight for only a minute. 2. Check the Fences: If you do have a fence and self-closing gate around your pool, make sure they’re safe. Check your fencing to make sure the spaces between each of its pickets and between the bottom rail and the ground are no more than 4 inches apart and that the fence is at least 5 feet tall so children and animals can’t squeeze through or climb over to get into an unattended pool. Keep bushes and outdoor furniture away from the gate to keep children or unwanted visitors from climbing on them to hop over your fence and into your pool. 3. Make Sure Your Pool Drain Covers Are Visible And Intact: Let’s face it, if you can’t get a clear look at your pool’s drain covers, you won’t be able to see a distressed swimmer under the water or a person entrapped on a drain — and your pool water needs cleaning! If you can see the drain covers, make sure they’re not broken or chipped and remind children not to play near them so they can’t get sucked in and trapped. 4. Have Two Pieces of Safety Equipment: Every pool should have two essential pieces of safety equipment: a life ring (life preserver) with a diameter of at least 17 inches that can be thrown to help struggling swimmers stay afloat, and a safety hook to pull people to safety. You should also consider keeping a phone at the pool while swimming so if you need to make an emergency call, you can do it quickly. 5. Repair Any Damage to Decking, Equipment and Pool Area: Make sure pool ladders and pool railings are secure so people aren’t hurt when they rely on them to get in and out of the pool. Repair damage to decking to prevent people from tripping. 6. Test Your Pool Water Routinely: Keeping your pool safe is more than protecting against drowning and physical accidents. You need to keep your pool water clean, too, so people don’t get sick swimming in dirty water. Testing the chemical balance of the water in your pool is one of the most important things you can do to make sure it’s up to par. That’s because that balance — which keeps your water disinfected, clean and safe — can be easily thrown out of whack by heavy use, hot weather, rain and lots of other things. To keep your pool safe, test the chlorine and pH levels at least twice a week and daily if you can. 7. Don’t Swim If You’re Sick: Chlorinating your pool only does so much. You need to keep germs out of the pool. Practice good hygiene. Don’t swim when you have diarrhea, which can introduce cryptosporidium, E.coli, norovirus and other germs into the water and make others sick for weeks. If there is an accident in your pool, be sure to clear the pool and follow guidelines for proper cleaning of the water. In the case of cryptosporidium, that typically requires hypochlorination — using extremely high levels of chlorine. 8. Skim, Brush and Vacuum Your Pool Regularly: There’s a lot of stuff out there that can get into your pool. It will not only make your pool look like a mess, it could make it tougher for your chemicals to keep the water clean. Swimmers can carry in sunblock, oils and other items. There’s dust, sediment and leaves blowing in the air that can all make it a lot harder for your filtration system to keep things clean. So use a hand skimmer to clean your pool’s surface, brush the walls and vacuum its floor often. Don’t forget to remove any leaves and debris in the skimmer baskets. 9. Keep Your Deck Clean: It only stands to reason — the less mess there is on the deck surrounding your pool, the less stuff that can be blown or carried into it. A good sweeping will go a long way to keeping your pool looking pristine. 10. Keep your Pool Filter Clean: If you have a cartridge-based filter, make sure to check, clean or replace your filters when they’re dirty. If you’re using a sand filter, make sure to backwash and clean your filter screens when they need it.